When you’re trying to get the best performance and the best aesthetics for your Harley, you’re going to need the best motorcycle chains on the market. If you aren’t a motorcycle expert, however, knowing anything about motorcycle chains is difficult. Do you want a pre-greased chain or a chain that you have to grease yourself? What about chain material? Does the length of the chain make a difference? In this article, we’ll answer these questions for you and give you a handful of reviews of the best motorcycle chains on the market so that you can ride in style and power. What Should I Look For In A Motorcycle Chain? How Long Should I Expect My Motorcycle Chain To Last? Are There Any Brands To Seek Or Avoid? Can I Install My Chain At Home? Does The Chain Material Matter? 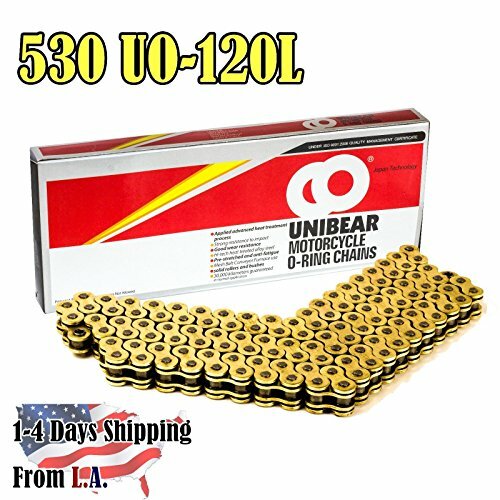 With this Unibear chain, you’ll get a golden chain with 120 links. You’ll also get one connecting link so that it will be easy to perform any custom linking that you need. This chain weighs three pounds and is pre-greased. You won’t need to perform much maintenance with this chain. Nor will you need to worry about it breaking. Thanks to its alloy steel material and 10000-pound tensile strength, this chain is ready for the long haul. The pitch size on this chain is 5/8ths of an inch, and it utilizes an O-ring style hookup. These features mean that it will be compatible with the vast majority of motorcycles produced in the US, not to mention the majority of gas-driven motorcycles internationally. Thanks to the O-ring, this chain gets permanent suction between the bush and the pin. The links themselves have four-side riveting and anti-fatigue contours. The chain is also pre-stretched, meaning that you won’t need to break it in like you might with others. With this chain, you’ll get racing-level performance without breaking the bank. Because this is a mini-chain, it needs oversized alloy pins to shore up its strength. While you won’t have a problem with the strength of this chain, its 5000 pounds per foot tensile strength may be a bit light for some applications. The chains themselves use seamless rollers and bushings. The material of the chain is chromoly steel, with alloy plating on the surface. With this chain, you’ll get a bit more durability than you would out of other mini-chains thanks to a pre-treatment with heat induction transfer. While this drive chain isn’t as aesthetically appealing as a few of the other chains which we’ve reviewed so far, it does have the best technical specifications and also the highest durability. The 120-link chain is made with steel alloys, weighing a mere eight ounces while exhibiting extreme strength. Notably, off-roading chains tend to be a little bit shorter and weaker than other chains on a per-link basis despite offering better performance overall. Each roller is a compact 7.77 millimeters, and each pin is 15.05 millimeters. Notably, the inner plate thickness is 1.6 millimeters in comparison to the outer plate thickness which is symmetrical at 1.6 millimeters. Symmetrical thickness is critical for off-road applications where frequent juking can induce torsion or other unintended forms of force on the chain. Chains which aren’t symmetrical can’t bear these issues and experience lower durability as a result. While the tensile strength of each link is 4189 pounds per foot, the symmetrical plate thickness more than makes up for it. 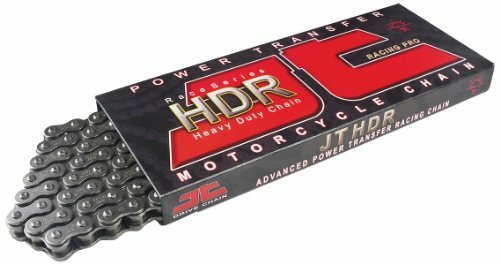 The JT Sprockets (JTC420HDR134SL) Steel 134-Link 420 HDR Heavy Duty Drive Chain is similar to the other JT Sprockets heavy-duty drive chain which we’ve reviewed so far, but has a few more links. With 134 links, this chain is ready for the widest of gaps. Like its smaller sibling, the chain is composed of heavy-duty steel alloy, which should be compatible with most modern motorcycles. This chain is ready for the muddiest and roughest off-road terrain. You can use it in any street bike, motorcycle, ATV, or off-roader for maximum performance. The pin and link dimensions are very similar to its smaller sibling. The roller diameter is 7.77 millimeters, and the pin length is a standard 15.05 millimeters. Both of the plates are 1.6 millimeters in thickness, meaning that the symmetrical plate thickness will afford your chain with a lot of durability. This chain has two pin rivet presses, which are the weak points. It also has a clip-style master link, which wouldn’t be ideal for applications other than off-roading. But, because you probably expect to need to re-fit this chain from time to time, the clip-style master link is a good feature which will make your life easier. 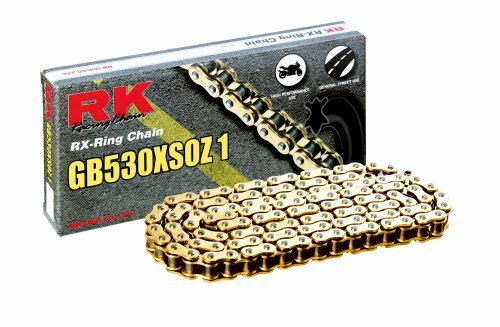 The 530XSO chain uses the RK-ring seal which helps to keep maintenance quick and breakdowns infrequent. This chain has two lubrication pools, which means that it has two seal points. This is different from a normal O-ring style design, so you will need to perform two lubrication steps instead of one. The difference is negligible, and the benefit is potentially massive. So long as you keep this chain well-lubricated, it’ll be in good shape for a long time. Installing this chain may be difficult for amateurs, however. It isn’t a standard O-ring design thanks to its double lubricant pools. The manufacturer’s estimate is that this chain will last between five to eight times as long as other chains, provided that you perform the occasional re-lubrication. This means that you could be using this chain for the rest of your bike’s lifetime. With this chain, you’ll get solid rollers and bushings rather than the normal multi-layer design. Likewise, these bushings are kink-resistant, which means your O-ring will last much longer than it would otherwise. This chain has a 19.8mm width and is made with heavier materials than most chains. This means that the chain weighs roughly six pounds, which is potentially six times heavier than other chains of comparable size and function. For a motorcycle intended for highway cruising, the difference in weight might be a noticeable decrease in the fuel efficiency of the bike. For a sport vehicle, the added weight will detract from maneuverability but you won’t need to perform as much maintenance. If the tradeoffs of this chain are right for your bike, you’ll find that it needs a bit of lubrication to stay in good shape. The chain itself isn’t about to break but it can become discolored from heat relatively quickly because it isn’t pre-tempered like many other chains are. The 520 UO-120L chain utilizes 120 links rather than 124 or 134. Because it is made in Japan, you will find that not all motorcycles can fit this chain. Nonetheless, the chain is pre-greased, and claims to need no maintenance whatsoever. If you are an amateur biker who doesn’t want to spend a lot of time messing with their chain, this low-maintenance solution might be the right one for you. You will probably need to come to terms with the chain’s short lifespan, but the fact that it never needs maintenance will be a favorable tradeoff. You should be looking for several things in your motorcycle chain. First, your motorcycle chain must accept lubricant and retain it. Many chains have multiple lubricant pools to provision for this, but the majority of bike chains only have one place for greasing or lubrication. Lubrication helps to keep your chain and the rest of your motorcycle in good condition. The more areas to put lubricant, the better condition the chain will be in, but you’ll use more lubricant. Likewise, pre-greased chains may not be ideal because they often are very difficult to re-lubricate once the manufacturer passes them off to you. The largest single concern about your motorcycle chain is that it will be durable. Your chain goes through a lot of stress, and ideally you would not replace it very frequently. Chains with higher tensile strength are usually better than those with lower tensile strength, though there are exceptions to the rule. As with many parts of your motorcycle, you can expect your chain to last a long time if you take good care of it and don’t use your bike very often. With an average chain, you can expect five to ten years of driving, depending on how strenuous your driving is. For off-roading, using the wrong chain can mean a broken chain within a year or less. Alternatively, if you only plan on driving in the best possible conditions and on a highway, even a weak chain will last at least five years. All chains will last longer if you lubricate them frequently. This means that you should get a chain which can be detached easily if you think that you will want to perform maintenance often. Stainless steel chains tend to last a bit longer than alloy chains because they have a heavier weight. The added weight means that there’s a lot more material that has to become compromised before the entire chain fails. On the other hand, stainless steel chains are much heavier than alloy chains, so they can potentially experience more stressors than the alloy chain would. There aren’t any brands to seek or brands to avoid per se when it comes to motorcycle chains. The main issue is that some brands produce chains which are more likely to be compatible with ATVs or off-road bikes than genuine motorcycles. 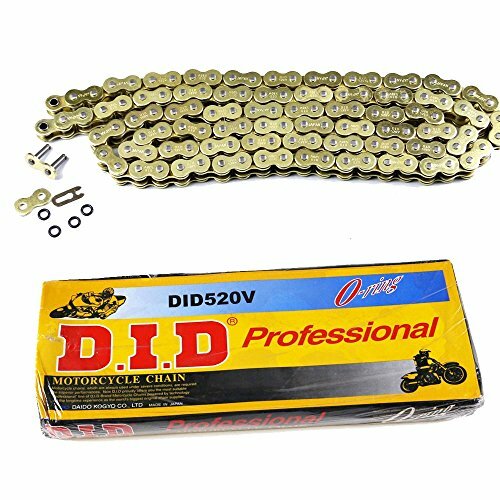 To be clear, these chains may still work in your motorcycle, but on average you will need to shop around for longer until you find the right chain. On that note, chains from non-American manufacturers also may suffer from these compatibility issues. Especially for chains produced in Japan, you may find that links or O-rings do not connect cleanly to American parts by default. There’s no guarantee that the products produced by these manufacturers won’t work. But it isn’t a sure thing. You will need to do your research. Yes, you can install and maintain your motorcycle chain at home. Some chains are easier to install and maintain than others, however. O-rings are the most difficult part of chain installation and maintenance. Chains which have a master link are the easiest because they can snap on and off without any ambiguity regarding whether it is connected correctly or incorrectly. Dual-link systems or other linking systems can be problematic for home installations. While many of these systems are easy to understand, they may require a lot of manual labor if the capstone link becomes disassembled. Some may enjoy the process of re-assembling the critical links after a maintenance session, but it can be very tedious. So, while it may be very easy to maintain a chain while at home, you may want to get help for installation to save yourself the hassle. The chain material matters, but the way the chain was treated after being produced is more important. Many manufacturers apply heat tempering to their chains, and this makes a huge difference in the quality of the chain regardless of the chain’s material. As far as chain materials go, what you see is not always what you get. Many manufacturers boast about the alloys used in producing their chains. Alloys are not necessarily stronger than run of the mill stainless steel, however. Many alloys have weaker tensile strength than steel. Nonetheless, they can provide superior weight characteristics and heat resilience. Alloys tend to be much more expensive, however. Many manufacturers don’t provide uniform materials in their chains. Unfortunately, multi-material chains are the worst possible chain because they have the weaknesses of each of the materials. Alloy is usually the metal on the outside of multi-material chains. Thanks to a steel core, the alloy’s lightness is negated. The steel core’s strength can’t contribute to the integrity of the entire chain because it doesn’t touch any of the interfaces of the links. So, avoid multi-material chains.